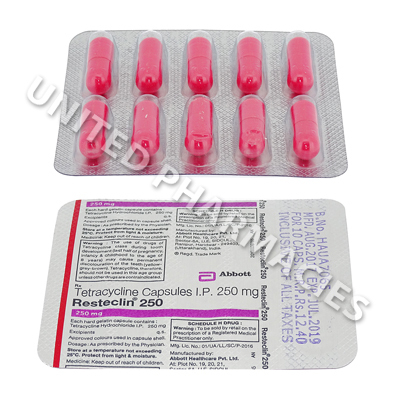 Resteclin (Tetracycline) can be used to treat many different conditions. Many patients use it to treat acne. It is also commonly used to treat other types of infection caused by bacteria, such as respiratory and urinary tract infections, skin infections, gonorrhoea, stomach ulcers caused by Helicobacter pylori (a type of bacteria), as well as others not listed here. Resteclin (Tetracycline) can be used to treat many different conditions. Many patients use it to treat acne. It is also commonly used to treat other types of infection caused by bacteria, such as respiratory and urinary tract infections, skin infections, gonorrhoea, stomach ulcers caused by Helicobacter pylori (a type of bacteria), as well as others not listed here. Doctors will often prescribe it to treat Lyme disease. This drug is a type of antibiotic, and it works by stopping the spread and growth of bacteria. To ensure maximum effectiveness, you doctor will most likely recommend that you take each Resteclin (Tetracycline) capsule on an empty stomach. Either take it 1 hour before eating, or else 2 hours after a meal. However, if you suffer from an upset stomach, you may be directed to take it with food. The exact dosage is decided by your doctor, and adults are usually told to take it 2 to 4 times per day. Swallow the capsule whole, and do not chew or crush it. Even if your symptoms disappear, you must keep taking it until you have finished the entire amount prescribed to you, as stopping treatment early could result in your symptoms returning. Inform your doctor about any side effects which you experience while taking this medication. There is a risk of more severe and potentially dangerous side effects associated with taking this medication. You must get medical assistance straight away if you notice extreme pain or discomfort in the mouth, fever, blistering of the skin or any other reactions which have not been mentioned here. Antibiotics are only to be used when treating infections caused by bacteria, and will not treat viral infections. There is a possibility that taking this medication can increase the sensitivity of the skin to sunlight. For this reason, sunlamps should be avoided, and patients should minimise or avoid exposure to sunlight. Always use Resteclin (Tetracycline) as you have been prescribed by your doctor. Never self-medicate or change your dosage without first consulting your doctor. The correct dosage can vary depending on your health, medical history, and the severity of the condition being treated.